Did you dream as a kid your best friend was a large loyal dog who followed you to school and protected you? I did. The reality of large breed ownership as an adult hasn't quite measured up to my childhood vision (big dog = more of the things about a dog you don't necessarily want!). 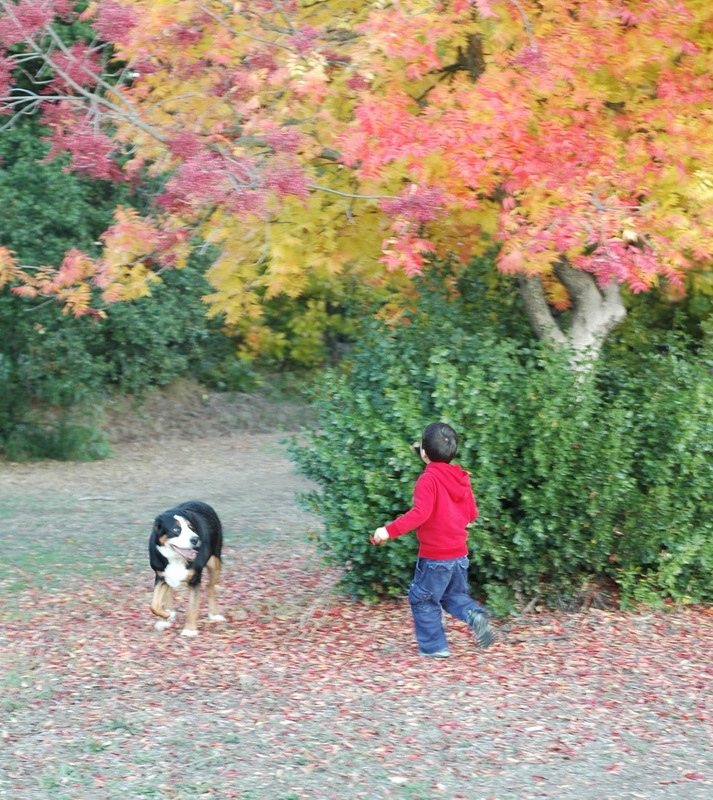 On days like these, though, when I watch my son with our Swissy named Izzy, all that dog poop almost seems worth it. They frolic, run and explore together. The boy and his dog see squirrels running up pink-leaved trees . They love each other and protect one another. What were some of your childhood dreams? Did they turn out to be what you thought they'd be? Does anything turn out how we thought it would be at 4 years old?!! Thanks for your visit today. It was a strange-slightly-stressful-busy week. My son and I did do a couple of cool projects though, so hopefully I'll get around to rolling them out. When we were very young (> 8rs old) we had a german sheperd (Hans) who was our best friend. He was super protective and just loved us. As pre-teen and teenagers we had a sheltie who was also our best friend. He was,as we say "a brick short of a wall" due to malnutrition before we got him. But the most fun and loyal dog. Then almost two years ago my husband & I got an australian sheperd. He is a kid for us. He loves attention, is always protective, follows me around everywhere (even the bathroom) and truly a gently soul. He has been trained for cattle herding and loves it. He just has a bit of an issue - there must be ADD for dogs. But there is a lot to be said that when you arrive home his little stub tail is wagging and causes his whole back end to wag with it. Pets can become a member of the family but for their sake they still have to understand that they are still an animal and have that discipline neccesary to assure this. Loved the pics and the story! @txtisha, great to hear from you! Ah, you were so lucky to have Hans growing up. When I think about how badly I wanted a dog of my own back in our Paris days, I realize how it's my honor to now be the adult responsible for all the downsides of dog ownership so our kids can experience the joys. Our Izzy girl is charmingly incontinent, so it's not uncommon that my morning is spent cleaning up after the dog, changing a diaper, and helping my son wipe. My glamorous life! Truly, our Izzy girl is so caring, protective, smart and nostalgic. I feel 10X safer with her big booming bark warding off those who approach the house (though she and I don't always agree on perceived threat ;-). She earns her food and care around here.